What are the signals that can be derived from switchSENSE® experiments? Hydrodynamic changes can be detected as changes in the Dynamic Response. Generally, events that increase the hydrodynamic friction, such as binding of an analyte molecule to the ligand, result in a slower switching motion, which can be observed as a decrease of the Dynamic Response. On the contrary, events that reduce the hydrodynamic friction, for example during conformational changes, cause the DNA nanolevers to switch faster, which can be observed as an increase in Dynamic Response. Figure 3: The molecular dynamics of the DNA switching process reflect the hydrodynamic drag, which is exerted on the DNA nanolevers. This specific hydrodynamic drag is characterized by the nanolever’s switching speed, which can be quantified by the Dynamic Response (DR) level. Changes that affect the hydrodynamic conditions (e.g. analyte association) are reflected in changes of the DR value. The size of a molecule can be described using the hydrodynamic diameter (DH), which corresponds to the diameter of a perfect sphere with the same hydrodynamic friction coefficient as the molecule of interest. DH of proteins or protein complexes can be determined using a mathematical model to describe the hydrodynamics of the switching motion of the DNA nanolevers. This so-called Lollipop Model treats the DNA nanolevers as charged and rigid cylinders that carry a spherical molecule at the distal end (Figure 4). Solutions to this model provide the hydrodynamic diameter of the attached molecule in nanometers. Figure 4: The lollipop model mathematically simplifies the hydrodynamic properties of DNA nanolevers with attached protein molecules by assuming that the DNA is a charged and rigid cylinder that carries a spherical body on top. Solutions of the lollipop model provide the hydrodynamic diameter of the attached protein in nanometers. FPS changes in the local environment of the fluorophore are detected by changes in the intensity of the fluorescence emission. The fluorescence emission can either be enhanced or decreased, for instance by changes in the local hydrophobicity. A typical application of FPS is the real-time detection of the association of an analyte to an immobilized ligand molecule. Figure 5 shows an example of how binding of an analyte can be observed as a quenching effect of the fluorophore. Due to the permanent Brownian motion of the fluorescent dye, it constantly probes its local environment, which results in a specific fluorescence emission. Once the local environment of the dye is changed resulting from association of the analyte, the fluorophore probes an altered molecular surface, thus sensing the presence of the analyte molecule. This results in the presented example in a decreased fluorescence emission. Figure 5: Permanent sensing of its local environment causes the fluorescent dye to emit a specific intensity of fluorescent light. The association of an analyte molecule influences the local environment, resulting in a decrease of fluorescence emission. An example, in which the fluorescence intensity is increased upon association of an analyte molecule, is shown in Figure 6. In this case, the fluorophore possesses a certain affinity to the immobilized ligand molecule, for instance to a hydrophobic enzymatic cleft of the test protein. While the fluorophore is bound to the immobilized protein, the fluorescence emission is quenched. The interaction with a specific analyte molecule interrupts the weak interaction between fluorophore and protein by displacing the dye. The released fluorophore can now move freely and is not quenched anymore, which can be observed as an increased intensity of the fluorescent light. Figure 6: A weak interaction between the fluorescent dye and the immobilized ligand molecule results in a low base-line fluorescence intensity, due to the quenching of the fluorophore. A specifically binding analyte competes with the fluorophore and displaces it from the protein, thus enhancing its fluorescence intensity. The second analysis signal that utilizes the absolute fluorescence intensity of the fluorophore as read out, is the Molecular Ruler analysis. While FPS detects changes in the local environment of the fluorescent dye, effects that can be detected from a Molecular Ruler signal, affect the average distance of the fluorophore to the gold surface and thus the degree of fluorescence quenching. Examples of such processes are association of DNA-binding proteins that change the DNA conformation (e.g. by bending; Figure 7) or enzymatic DNA elongation by polymerases. Figure 8 explains the Molecular Ruler principle using the example of a polymerase driven DNA elongation. Figure 7: DNA binding proteins that associate to the DNA backbone often cause a conformational change of the DNA by bending of the double helix. This changes the position of the fluorescent dye at the distal end of the DNA nanolever, which is associated by a change in fluorescence intensity. 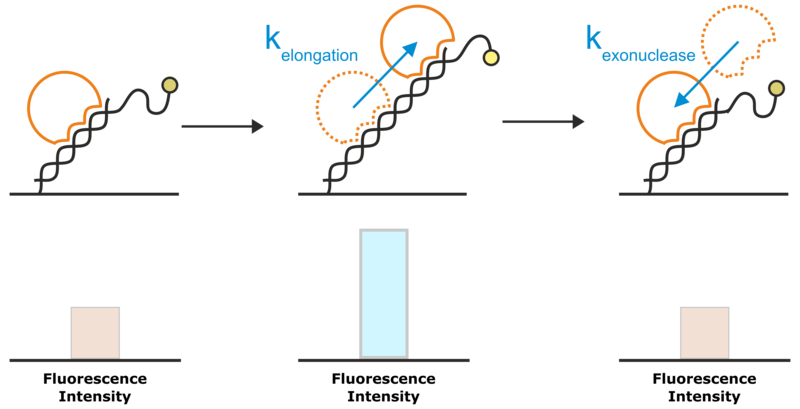 Figure 8: A very common application of the Molecular Ruler principle is the investigation of DNA elongation kinetics by polymerases. The template for the DNA elongation is a double-stranded DNA nanolever that is modified with a single-stranded overhang. In the initial state, the partly single-stranded nanolevers exhibit a relatively low fluorescence intensity, owing to their high flexibility that allows them to approach the quenching gold surface. Once a polymerase starts to elongate the DNA, the single-stranded DNA overhang is converted into a rigid double-helix. The transition from the flexible single-strand DNA into the rigid double-strand moves the average position of the fluorophore further away from the gold surface, which results in an enhanced fluorescence intensity. For enzymes with exonuclease activity, the reverse approach yields a decrease in fluorescence intensity. How do I know which channel to choose for my assay? The easiest way to check if your flow channel is suitable for the planned experiment, is to perform a status check of the desired flow channel. For further reading please see “What is a chip status test and how should I interpret it?”. Can I use all four flow channels of a switchSENSE® chip simultaneously? You can only observe an experiment in one flow channel at a time. Nevertheless, you can run subsequent experiments in all the channels: consecutive experiments can be set up for the different channels in the switchBUILD software by inserting a “new channel” element into the taskflow. The DRX will automatically use the flow channels in the preset order. What is a chip regeneration? How do I know, if my chip regeneration was successful? Chip regeneration implies that all ligand molecules immobilized on switchSENSE® electrodes in one flow channel and all potentially bound analyte molecules are completely washed off the sensor surfaces by treatment with a regeneration solution. This leaves single-stranded DNA nanolevers on the sensor electrodes, which can be re-functionalized with fresh ligand molecules by hybridization to the corresponding complementary DNA nanolevers. The regeneration process contains two crucial steps: the denaturation of the double-stranded DNA nanolevers, leaving single-stranded DNA molecules on the electrodes and successively, the hybridization during which double-stranded nanolevers are formed again. The hybridization of the DNA nanolevers is usually monitored during a switchSENSE® experiment. Figure 10 shows typical fluorescence intensity traces corresponding to the transition of single stranded DNA nanolevers to double stranded DNA nanolevers. The basic effect that allows to observe DNA hybridization on a switchSENSE® sensor electrode is that single-stranded DNA nanolevers and double-stranded DNA nanolevers exhibit remarkably different switching properties. Due to its high flexibility, single stranded DNA can only be switched within the area above the electrode that is subjected to electric field, which extends to only a few nanometers into the electrolyte solution. In contrast to this, double stranded DNA is very rigid, with the consequence that during the repulsive switching phase, parts of the DNA nanolever that are exposed to the electric field push the major part of the nanolever far beyond the electrically affected areas. As stated previously under the Molecular Ruler principle, this translates to an increase in repulsive fluorescence intensity (Fup) and in switching amplitude, which is defined as the difference between the repulsive and attractive fluorescence intensity (ΔF). Figure 10: The denaturation of double-stranded DNA nanolevers using a regeneration solution with a basic pH value followed by re-hybridization, yielding double-stranded DNA nanolevers, are the two key features that facilitate the unique regeneration process of switchSENSE® electrodes. After denaturation, which is not recorded by the sensor system, the switching process can be monitored by observing the attractive (Fdown; dotted line) and repulsive (Fup; solid line) fluorescence intensity values. As long as the DNA nanolevers remain in the single-stranded state, the Fup is comparably low, with a reduced switching amplitude (ΔF). The hybridization of the complementary DNA is marked by a significant increase of Fup and therefore of ΔF. The denaturation of the double-stranded DNA nanolevers is automatically carried out by the DRX instrument by treatment of the sensor surfaces with the basic Regeneration Solution, leaving single-stranded DNA on the sensor electrodes. In case this step is not successful, the DNA nanolevers on the sensor electrodes remain double stranded, which prevents hybridization of fresh DNA-ligand conjugates. Figure 11 shows an exemplary data set of a switchSENSE® hybridization routine, during which the denaturation step was not successful. The reason for absence of denaturation or incomplete denaturation is usually shortage of regeneration solution or inactive regeneration solution. The latter is sometimes observed when the regeneration solution was stored in contact with air for an extended timescale. How do I recognize insufficient denaturation? Check the absolute fluorescence intensity at the beginning of the regeneration trace. On successful denaturation, the fluorescence intensity is comparably low (Fup ~ 10 – 50 kcps). If the baseline of the hybridization trace (up to about 50 s after start of the measurement) is significantly higher, this denotes that the DNA nanolevers are still double-stranded. Figure 11: Fup (solid line) and Fdown (dotted line) traces of a hybridization routine after insufficient denaturation of the DNA nanolevers. It is clearly visible that Fup constantly remains at a high intensity level during the entire process, which indicates that there is no transition from single-stranded to double-stranded DNA nanolevers. In grey, the respective hybridization traces on successful denaturation are shown for comparison. After denaturation of the DNA nanolevers, the single-stranded DNA molecules on the sensor electrodes are re-hybridized to double-stranded DNA nanolevers by incubation with the respective complementary DNA molecules. This is a crucial step for switchSENSE® experiments, as it facilitates the immobilization of ligand molecules. Given that the denaturation step was successful, problems with the hybridization step are usually either caused by shortage of DNA solution or by incubation with non-complementary DNA molecules. Furthermore, the use of an insufficient concentration of complementary DNA will result in partial DNA nanolever hybridization. Figure 12 shows fluorescence intensity traces of three independent regeneration routines, which exhibit no or partial DNA nanolever hybridization. How do I recognize insufficient hybridization? Does the fluorescence intensity increase during the hybridization? The hybridization of the complementary DNA is accompanied by a significant increase of the repulsive fluorescence intensity (Fup), caused by the transition of the immobilized DNA molecules from single-stranded to double-stranded state. On successful hybridization with bare complementary DNA, the Fup intensity should at least increase by 100 %. Is there a switching amplitude, i.e. is there a significant difference between Fup and Fdown? Even in single-stranded state, switching DNA nanolevers exhibit ΔF values of about 10-20 kcps. If there is no significant difference between Fup and Fdown, this points to the presence of air in the flow channel, which is usually the consequence of an empty autosampler vial. Figure 12: Fluorescence intensity profiles of switchSENSE® hybridization routines. In each example, the hybridization of the DNA nanolevers was hindered by the stated cause. A: an empty DNA vial. If the volume of the complementary DNA solution is not sufficient, air is injected into the flow channel, which immediately ceases the DNA switching motion. Fup and Fdown now show identical values. B: use of non-complementary DNA or no DNA. In both cases, the single-stranded DNA nanolevers on the switchSENSE electrodes cannot hybridize to their complementary DNA and thus remain single-stranded. In this case, Fup and Fdown remain constant. C: concentration of the applied DNA solution is too low. Corresponding to other association kinetics, the hybridization of DNA nanolevers is affected by the concentration of complementary DNA. If the concentration of complementary DNA is too low, the hybridization process is not completed within the time-scale chosen by the switchBUILD software and neither Fup, nor ΔF reach a constant final level. Grey lines depict the case of ideal DNA nanolever hybridization. What can I do to improve the hybridization efficiency? Increase the concentration of complementary DNA. This is a simple but efficient way to increase the hybridization speed, which scales linearly with the concentration of complementary DNA. Increase the hybridization temperature. Elevated temperatures generally accelerate the hybridization velocity as is the case for most biochemical reactions. Secondly, nucleic acid ligands (overhangs) that are attached to the complementary DNA can form secondary structures that hinder the formation of the double-stranded DNA nanolevers. These secondary structures can often be de-stabilized by working at higher temperatures. To perform your hybridizations at temperatures above 25 °C, activate the expert mode of switchBUILD. The desired hybridization temperature can then be adjusted in the respective experimental element. Please ensure that the ligand molecules of interest are stable at the chosen elevated hybridization temperature. Reduce the salt concentration of DNA conjugate solution: Similar to increased hybridization temperatures, also a reduction of salt concentration in the hybridization solution simultaneously accelerates the general DNA hybridization process and also destabilizes secondary structures of nucleic acid ligands. Please make sure to choose conditions that correspond to at least 10 mM of total monovalent salt concentration to ensure sufficient shielding of the negatively charged DNA backbone. I see a decrease of the absolute fluorescence intensity in between chip regeneration steps. Is this normal? Briefly, the answer is yes. Decrease in the absolute fluorescence intensity is completely normal during switchSENSE® experiments. There are several factors that can affect the fluorescence emission, for instance photobleaching, chemical and thermal stress on the fluorophore, loss of DNA from the sensor surface or quenching of the fluorophore by a hybridized protein conjugate. So, do not worry about loss of fluorescence intensity between regeneration steps. When you observe an increase in the repulsive fluorescence intensity (Fup) during the respective hybridization, the sensor electrodes are successfully functionalized. For further reading, please also refer to “What is a chip regeneration? How do I know, if my chip regeneration was successful?”. How do I vent fluidic channels in switchCONTROL? After using a flow channel on a switchSENSE® chip (i.e. after any type of liquid has entered the flow channel), it must be vented before it can be removed from the chip holder. The selected microfluidic channels will be purged with air. What should I do, if the chip alignment was not successful? Eject the chip holder (without channel venting) and check if the chip was placed correctly in the chip holder. The chip was inserted correctly if you can easily read the “Dynamic Biosensors” label. Make sure to close the chip holder properly. This is the case, if you hear two clicks caused by the locking mechanism. Retract the chip holder again and check if alignment works. How do I plan a conformational change screening in switchBUILD? The first approach is to include a sizing measurement into a kinetic. This way, the association and dissociation kinetics of the test compound to the ligand molecule will be recorded and at equilibrium (in between association and dissociation) a sizing or stopped flow experiment will be performed. This approach is particularly suitable, if you are also interested in the kinetic rate constants and the affinity constant of the interaction between test compound and ligand. The second approach utilizes the sizing tool for His6-tagged proteins in switchBUILD. In this case, the His6-tagged ligand molecule is pre-incubated with the compounds to be tested, immobilized on the switchSENSE® chip and a sizing experiment is performed. Especially when testing very weakly binding compounds (e.g. fragments), this strategy is advisable as very long pre-incubation times can be chosen. What should I consider when working with liposomes/vesicles/bilayers? It is advisable to use a detergent-free running buffer (e.g. PE40 without Tween-20). (cholesterol intercalates into lipid bilayer). Use low flow rates for association and dissociation (e.g. < 50 µl/min) to prevent destabilization of membranes. What should I consider when working with peptides? A frequent problem in such experiments is the low solubility in water of some peptides. This can be improved by addition of a compatible organic solvent to both the running and the sample buffer used in your switchSENSE® experiment. A commonly used solvent is dimethyl sulfoxide (DMSO) which may be supplemented to the experimental buffer up to 5 % v/v. If a peptide contains charged amino acids, it is likely to exhibit a large mass to charge ratio which can prove to be problematic, especially when working with charged surfaces. The consequences range from extensive unspecific surface adsorption to the absence of specific binding due to electrostatic repulsion. If you observe such a behavior, try to increase to salt concentration of your running and sample buffer. This will increase the shielding of the charges of the peptide molecule. What should I consider when working with DNA/RNA – binding proteins? Experiments with proteins that target either double-stranded or single-stranded DNA in an unspecific manner (i.e. independent of the DNA sequence), can be easily performed with standard switchSENSE® chips. To achieve sensor electrodes functionalized with double-stranded DNA nanolevers, simply use unmodified complementary DNA as ligand molecule. For experiments with single-stranded DNA, just use X40 buffer as ligand solution. Protein/nucleic acid interactions generally show an extensive variety of different binding modes that facilitate the interaction. Due to this complexity, sometimes thorough assay optimization is required to characterize the interaction. Ionic strength: Many protein/DNA interactions are of ionic nature or ionic forces are required to initiate the interaction. As ionic forces are highly affected by the ionic strength of the buffer solution, the affinity of the interaction might drastically differ for different buffer solutions. At the extreme, this could imply the complete absence of interaction, if the ionic strength is too high, or completely non-specific binding, if the ionic strength is too low. pH: Furthermore, ionic forces heavily depend on the charge of the protein of interest. In turn, the protein charge depends on the pH of the experimental buffer solution. Thus, also the pH of the used buffer solution can affect the affinity in a comparable way as the ionic strength. Background affinity: Many nucleic acid binding molecules exhibit a certain background affinity to any type of nucleic acid. To differentiate this background affinity from sequence-specific binding, it is crucial to run experiments with a randomized control sequence, preferentially with equivalent base composition. Usually, the background affinity is weaker than the specific interaction, with the consequence that non-specific binding only occurs at comparably high concentrations. In many cases, background affinity can be completely abolished by optimization of ionic strength and/or pH of the buffer solution. If this does not prove successful, the addition of non-specific competitor substances (e.g. fragmented salmon sperm DNA or polydIdC) or other additives (glycerol, heparin) is often highly effective in reducing background affinity.